Paintbrushes carefully touch the white earthenware, whilst elsewhere clay is poured into handmade moulds. It is here, at Royal Delft, that craftsmen have been creating iconic Delft Blue for almost 400 years. A visit to Royal Delft, one of the icons of the Netherlands, should be on every expats’ bucket list. Discover the complete history, craftsmanship and innovation of Royal Delft during a visit. The Dutch East India Company sailed the seas of Asia in the 17th century bringing back exotic treasures from all over the world. 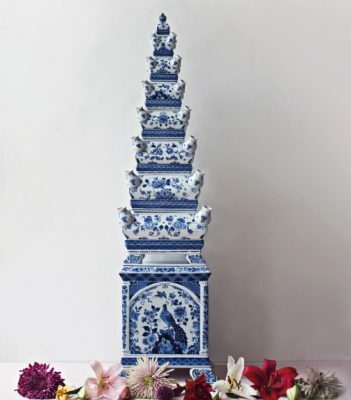 One of the most popular imports into the Netherlands was the beautiful blue and white porcelain from China. Wealthy Europeans quickly fell for its splendour and the pieces were found in houses all over the continent. Sadly, due to civil war in China the import ceased. The hunger for blue and white ceramics however did not. The entrepreneurial Dutch decided to imitate the Chinese porcelain and were successful in doing so. In a short time there were no fewer than 32 factories in Delft alone making blue and white earthenware! It was on 28 March 1653 that Anthonisz van der Pieth started ‘De Porceleyne Fles’ on the Oosteinde in Delft. Nowadays, there is just one remaining factory from the Golden Age: Royal Delft. This year, in 2018, Royal Delft is celebrating its 365th anniversary. 365 represents 365 years of Royal Delft, one year with 365 days, a cycle of four seasons or twelve months and a lot more! This extraordinary anniversary had to be celebrated! Throughout the years there are various activities planned, highlights being the temporary exhibition Nouveau Blue – from vision to realisation and the painting of a large tile painting by visitors. Royal Delft is a great experience any time, but this year there is even more reason to visit the last remaining Delft Blue factory from the 17th century. From 28 March the exhibition Nouveau Blue – from vision to realisation is open for public. 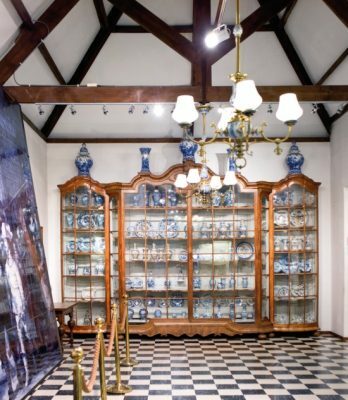 The exhibition focuses on an important part of Royal Delft and Delft Blue history: the end of the 19th century and beginning of the 20th century. It is in this period that, at Royal Delft, the norm was set for the Delft Blue that is made all over the world nowadays. Thanks to the vision of Joost Thooft and his accomplices revolutionary innovations were made in the production of Delftware. In the exhibition you discover what these changes were exactly, but you also get to know Thooft and his contemporaries more personally. What inspired them to do what they did and how did they end up at Royal Delft, all is explained in the exhibition. When visiting Royal Delft in 2018 you stand the chance of becoming part of Royal Delft history. In our hall there is a tile painting that consists of 365 tiles and each day we ask one person to contribute to the painting by decorating one of the tiles. At the end of the year the result will be a map of the world with highlights from all over painted by visitors from every corner of the world. A unique piece of Royal Delft Blue! Once your visit to Royal Delft has inspired you, why not try your hand at painting the iconic Delft Blue yourself? 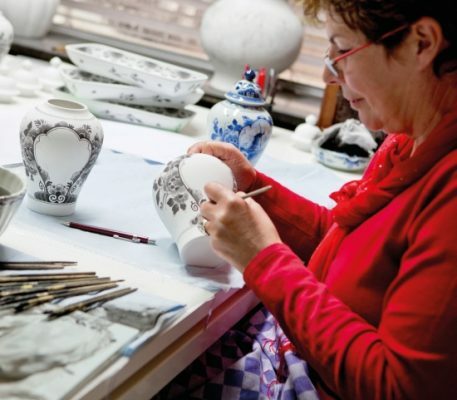 Discover which skills a master painter at Royal Delft requires to practice this extraordinary craft. You will be shown how to use all the various brushes and taught how the paint reacts to earthenware by a skilled mentor. After painting, Royal Delft craftsmen will glaze and fire the piece and we will send it to you later. This June Royal Delft opens Brasserie1653 on site, a hidden gem in Delft, with a stunning courtyard garden and terrace. Brasserie1653 is the perfect place to enjoy a cup of coffee with cake, high tea with friends or a delicious lunch after your visit to the Royal Delft Experience. But Brasserie1653 is always open for your visit, even if you don’t visit the Experience. Brasserie1653 opens 8 June. 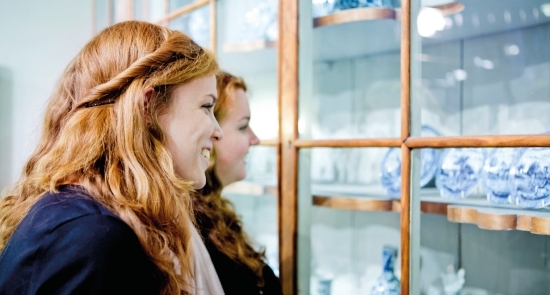 Royal Delft is the perfect place to buy your iconic Delft Blue souvenirs. Whether you are looking for a piece to take back home to family, a personalised gift for a colleague or a beautiful vase for at home, Royal Delft has what you are looking for. Aubine Zechner and her team are happy to help you find the perfect match, whether it is a piece from our Original Blue collection or a personalised piece by a Royal Delft master painter. Whether you have relatives visiting from abroad, are looking for a family day out or for that perfect gift, Royal Delft is the place to be.